On May 25th, 2015, a bouncy house was set up for children in one of the many basketball courts near Ft. Lauderdale Beach. 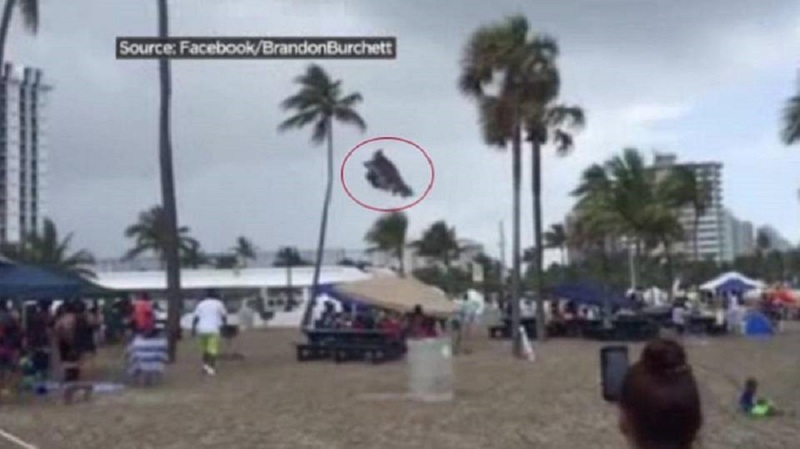 Unbeknownst to many families attending the Memorial day festivities, a waterspout later turned into tornado appeared suddenly and airlifted a bounce across a parking lot and into the roadway. The bounce house twisted, turned and finally flew 20 feet high in the air, as children were flung out. Only one of the three children was seriously injured; and thankfully, there were no fatalities. Lifeguard and medical attention were sought immediately, and luckily they are all okay and transported to Broward Medical Center. South Florida typically isn’t prone to tornadoes, but it is not impossible that they may occur on from time to time. For this reason, we should always take proper precaution when near water and remain vigilant to weather forecasts.